Check out this video created by Leland Lee. Today I showed the kid how to refinish the wheel. I got these wheels as a payoff for money owed to me back in the day. I never really paid attention to it since back then I was running mini lites 13x8s But until recently I tried to buy a set of tires for it. Well try and fine 215/50/13 the only ones I found were slicks. And so dam expensive. So with that comes the Enkei 15x7 rims. Its a lot easier to find tires for it. But it wasn't exactly in a nice condition. So we decided to refinish it andbringitback to its glory. So after the seats were set and e still had plenty of time to kill. We went ahead and decided to re-finish the Cusco roll bar. This bar had been on this car since the mid to late 90s. So they had seen their fair share of wear and tear. Didn't feel right to put it back on looking nasty and at one point I decided to pair it white, so its just right that we restore it to the original "Cusco Blue"
So we had nothing better to do the day after Christmass. We found an add on CL about some seats. We head over to Fairfield at Extreme Autosport. We got a deal on a pair of Replica Brides seats. Now before anyone ask why Replica, cause Im not about to spend retail on a real Bride. When this car will be beat up on once done. The Lady was very helpful and transaction went smooth. They have a nice selections of JDM goodies. Read more to see the install. We Moved to a New Shop! 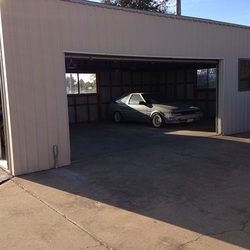 The reason why Matt hasn't done any update and or been working on his AE86 is that we moved to a new shop. No longer working at the side of the house. We now have a small but decent shop. We just need to organized our stuff and get some cool new toys for the shop. 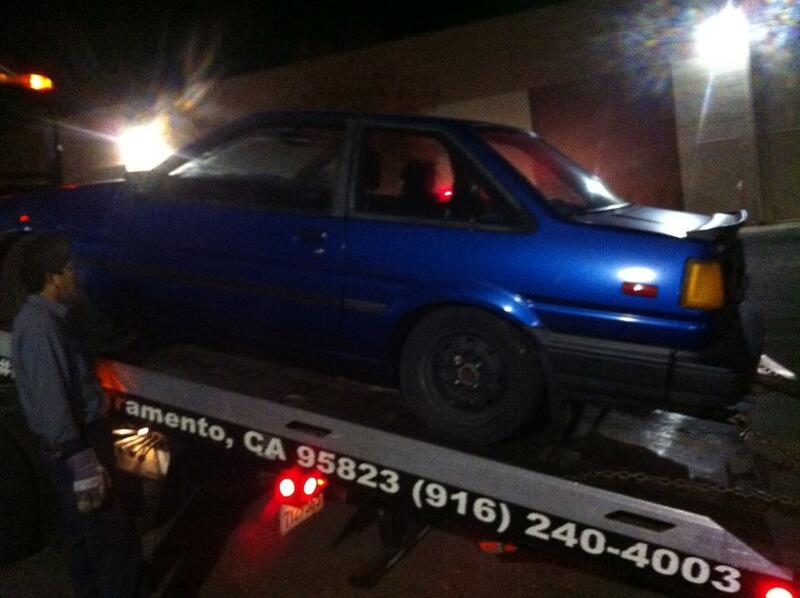 Look forward for more update on the AE86 and some other cars now that we actually have a place to work on cars. Stay tuned. Almost ready to run! So Matt got some more work done. He buttoned up the engine bay, Hooked up the gas lines, brake lines. He hit a little snag getting the fuel pump to turn on. But after swapping the fuse box under the hood, he got it working. I did had to help him diagnose the problem. Just too bad the timing belt cover is missing. So if anyone has an extra one they would like to part with please contact us. I think the next time he works on the car it will be ready to start. Hopefully no issues comes up. Once the car is running Matt plans on doing body work and getting it ready for paint. But at the same time school just started and I think we need to find a shop space to be able to do more work since winter is just around the corner. So after many days of just enjoying the summer break, and vacationing with the family. The Kid finally got some time to work on his AE86. I helped him pull the motor swap out of the donor car, so I don't have much (actually I didn't take any pictures from that). He spent most of the day cleaning and getting the engine bay ready for the swap. Swap over clutch lines and slave cylinder. SR5 is on the left side, while GTS is on the right side. He also swapped over the throttle cables, and fuel tank and fuel lines. We decided to drop the motor in the way it is and not do any mentainance or even cleaning for that matter. The swap was running good, and we will be doing work on the motor later on. For now we just want it running. Like all SR-5 to GTS swap. We recommend a good parts car. We happened to find one for a decent price on CL. OK, once you have a good donor car. You will need to swap everything over. We started out by stripping the car so all the wiring harness can be swapped over. Some will say that you only need to cut and add wires. But with a good donor car, alot of free time Something a 13y/o has alot of. We recommend just doing it right the first time. Matt2wee is a 13 year old kid that has been doing engine swaps since he was 11. His first engine swap was a Integra LS motor into a 90 CRX dx. Sure I helped him lift things, hold things that are too heavy for. Occasionally I would show him whats needed next. But for the most part he did it himself. Unfortunately someone decided to drive his Crx and introduce it to a pole. 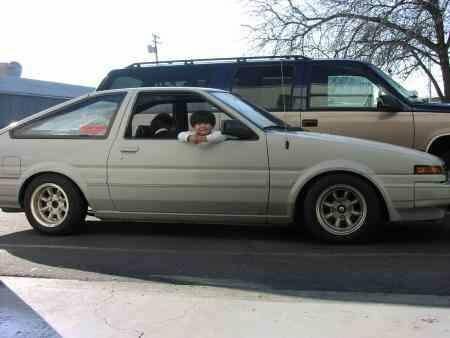 Stay tune as We feature his new to him AE86 and him performing a SR5-GTS swap, and as he transforms the car.